We are so excited to welcome Delia from Delia Creates. I love stopping by her site to find great tips and patterns for sewing. She also has an amazing list of kids crafts for all seasons and just any old time. Make sure you stop by and say hello! 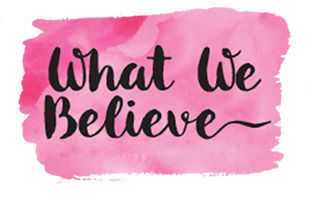 I am so excited to be here hanging with the Crafting Chicks! Our Christmas traditions, like many of yours, revolve around food. Finding out that our youngest child is severely allergic to dairy, eggs, and peanuts has sort of shaken up those food traditions. So this year…I thought why not shake things up even more. I took our traditional cinnamon roll recipe and made it vegan, or dairy free AND I made it yummier. Even though it’s dairy free. I promise you can’t tell it’s “different.” It’s delicious! You start by using my Best Bread Ever basic dough recipe found HERE. 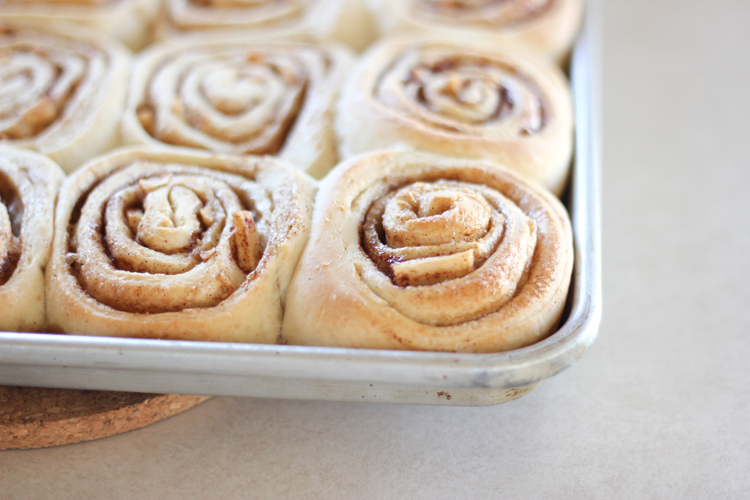 It not only makes the best bread ever…really!…but it is a great basic dough for rolls and cinnamon rolls. AND…it’s naturally vegan or dairy free. I used it in our pre-allergy days all. the. time. 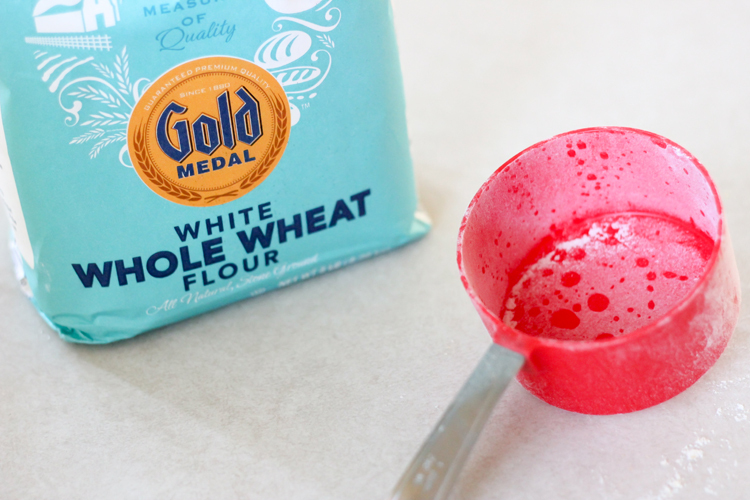 I don’t like to make the rolls too heavy, so I scale back on the white flour to white wheat flour ratio so that I am only adding 1-2 cups of white wheat flour. 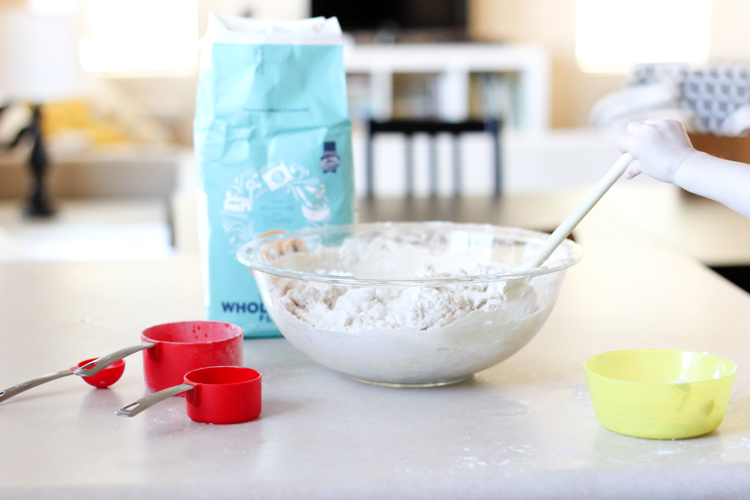 Once you get your dough mixed, turn it out on the counter and knead the rest of the flour in. 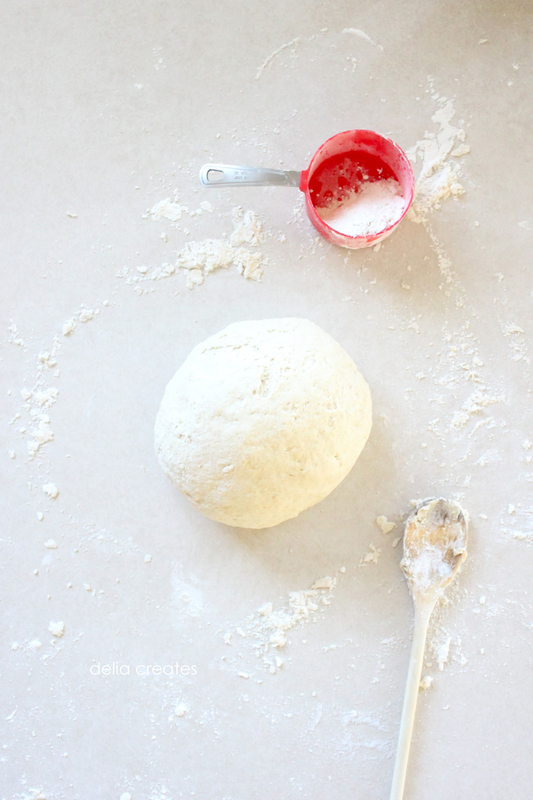 Knead the dough for at least 5 minutes. (If you are wondering about the yellow bowl, I set it out so my daughter could have her own bowl to mix…and… she insisted on mixing mine anyway ;)). 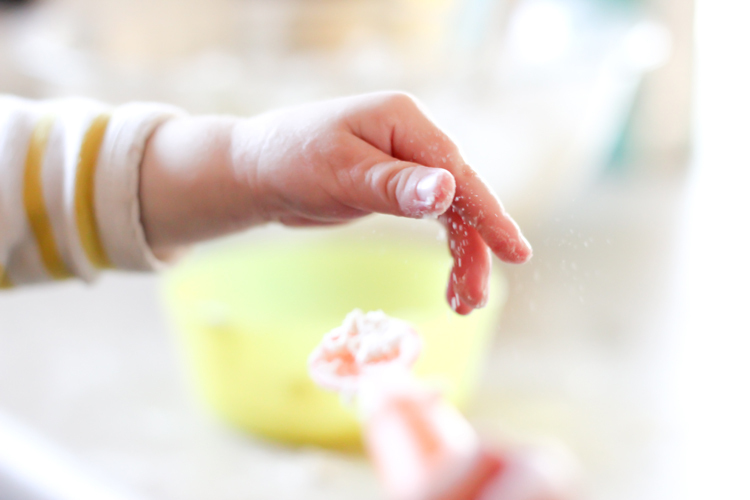 Make sure the counter is well floured so the dough doesn’t stick. However, be careful not to add too much flour. 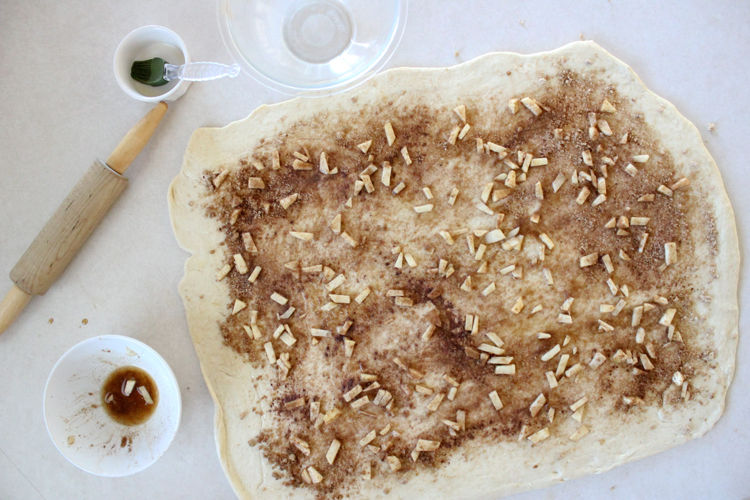 You want the dough to be soft, and very slightly tacky (not sticky) when you’re done. 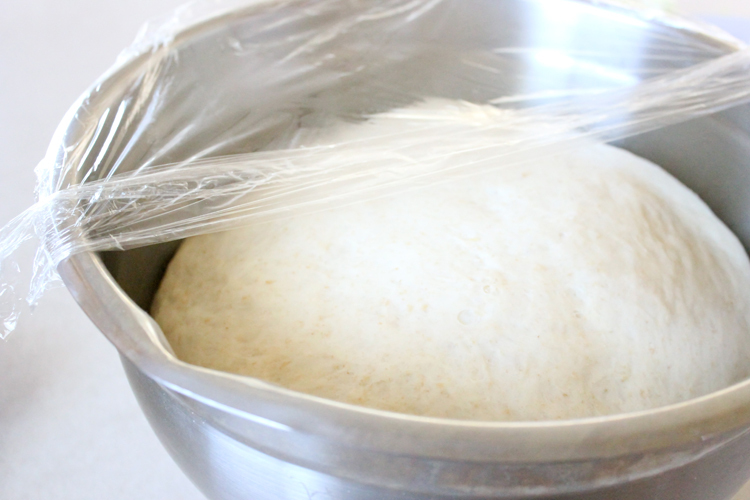 Form your dough into a round shape, put it into a greased/well oiled bowl, and let it rise until doubled. I like to cover mine with plastic wrap and place it in a warm oven so that it rises quickly and steadily. To get a warm oven, turn it on high for about a minute or two, then turn it off. 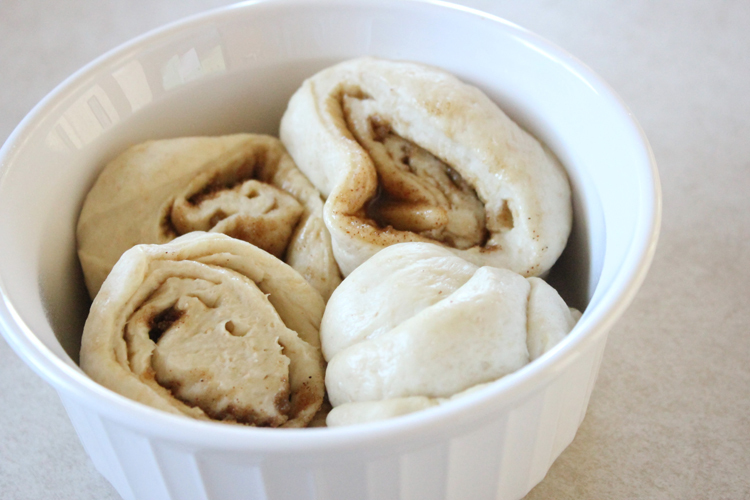 Place the bowl of dough inside and close the door. 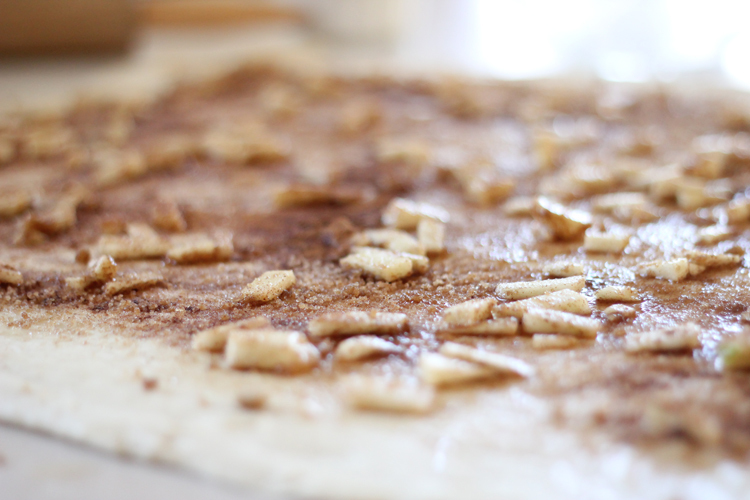 Mix 1/4 cup of white sugar, 1/2 cup of brown sugar, and two heaping teaspoons of cinnamon. I add a dash of nutmeg as well. 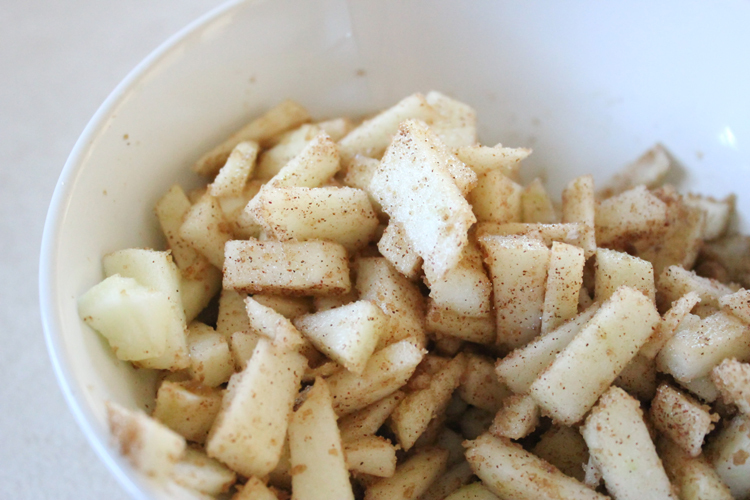 Peel and chop your one large apple into small, thin chunks. I prefer Granny Smith apples, also commonly used in apple pies, because it’s tartness complements the sugar and it softens but doesn’t become soggy while cooking. 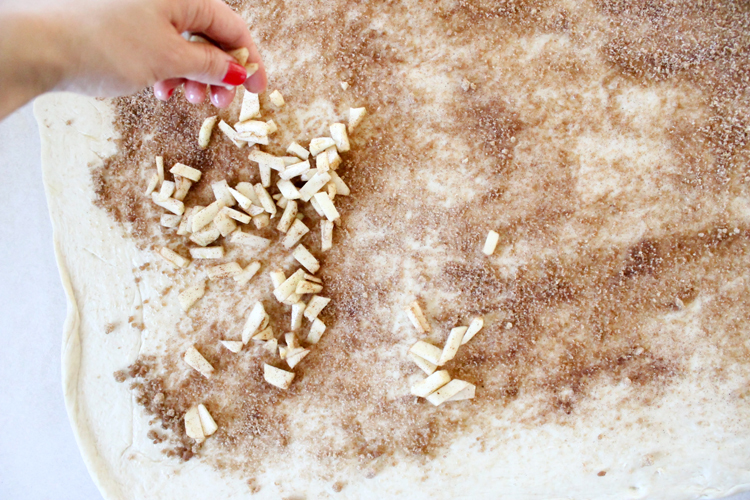 Sprinkle about 1/3 of the sugar mixture over the apples and mix. 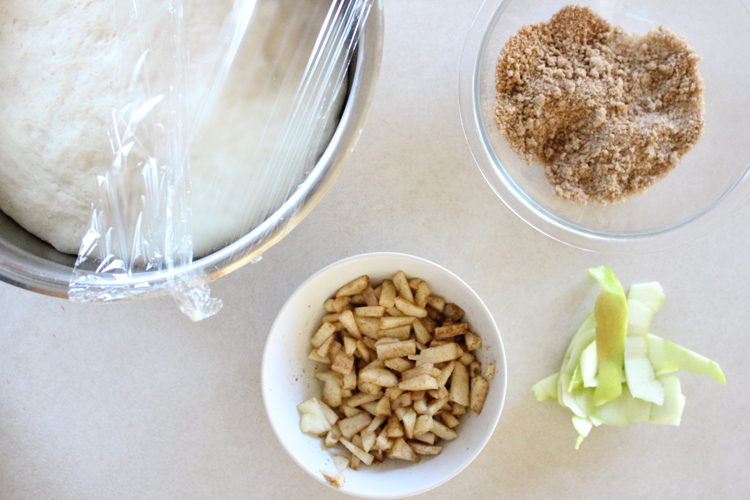 Your dough should be doubled now, you should have your sugar mixture ready and your apples set aside. 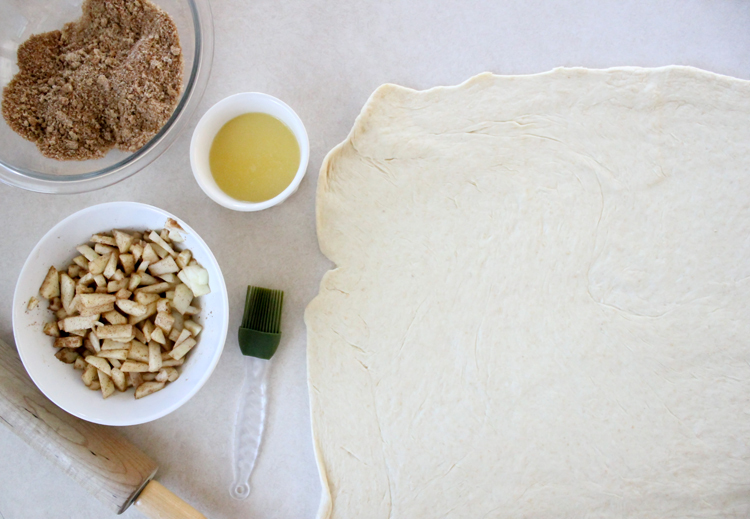 Before you punch down your dough. 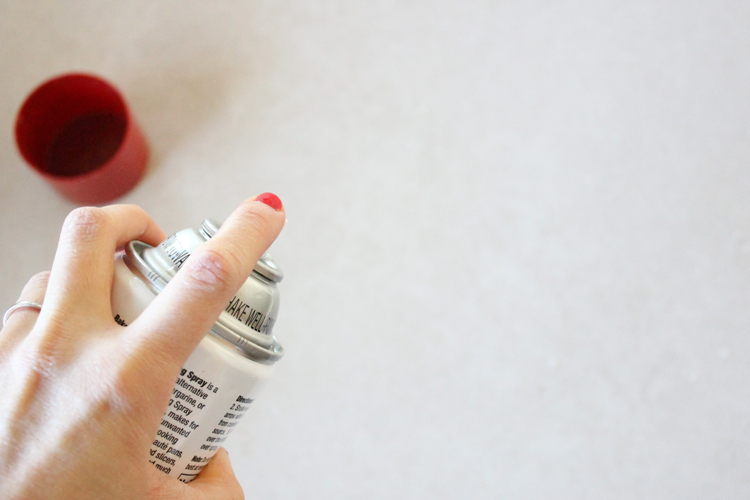 Clean off a large area of counter space and spray it with spray oil. 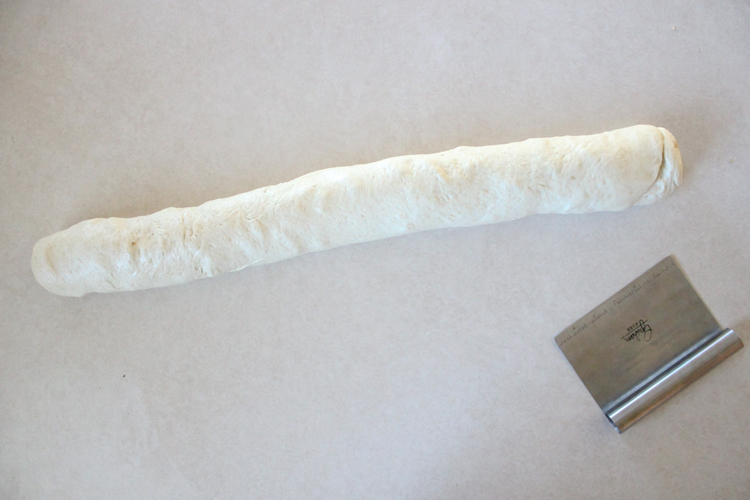 Now bust out your rolling pin and roll the dough out to about 1/4 inch thick. Roll and shape it into one large rectangle. Melt 3 TBSP. margarine (We use dairy and soy free Earth Bound brand, you can use butter instead of course). 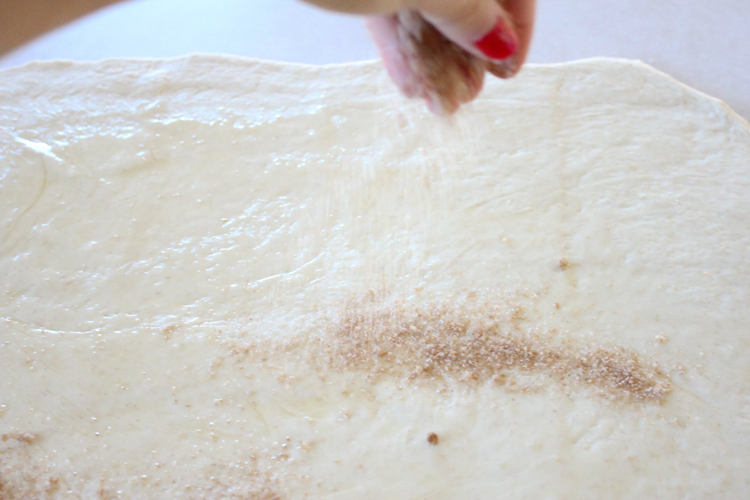 Drizzle and brush it over the top of the dough. 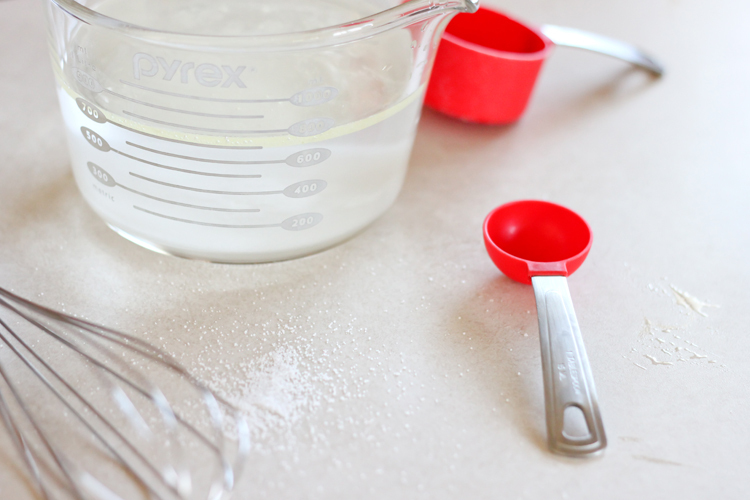 Sprinkle on all of your remaining sugar mixture. 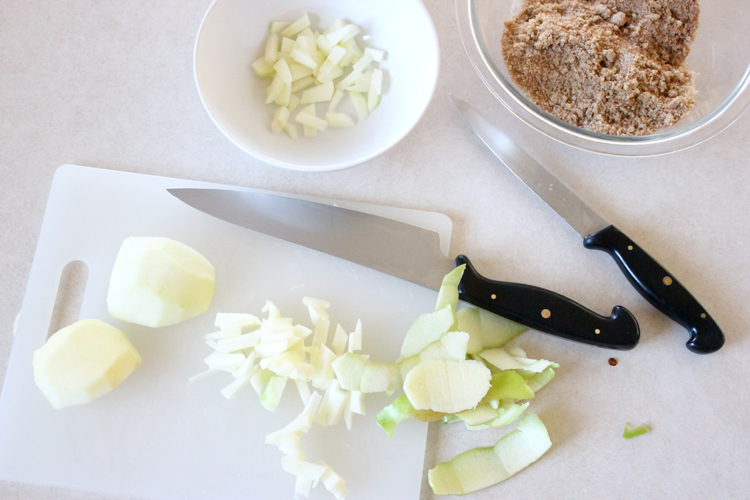 Next, add your chopped apples. You can add maybe a small handful of more apple chunks than this if you want more apples, but nothing beyond that. 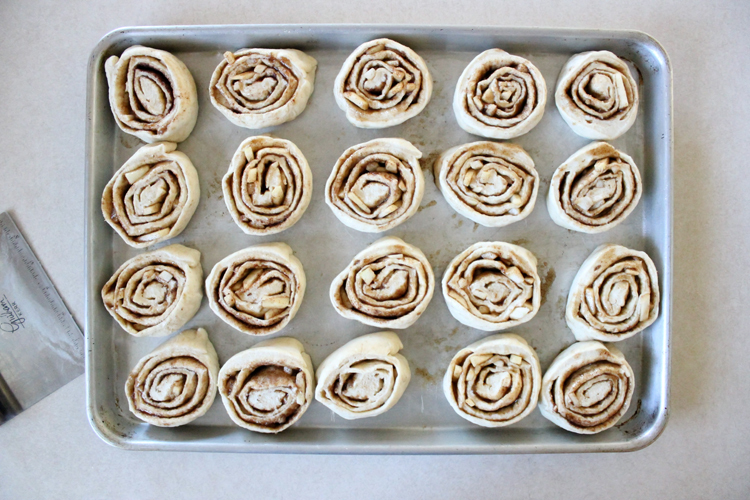 You don’t want to overfill the cinnamon rolls and have them break the dough when you roll it and cut it up. 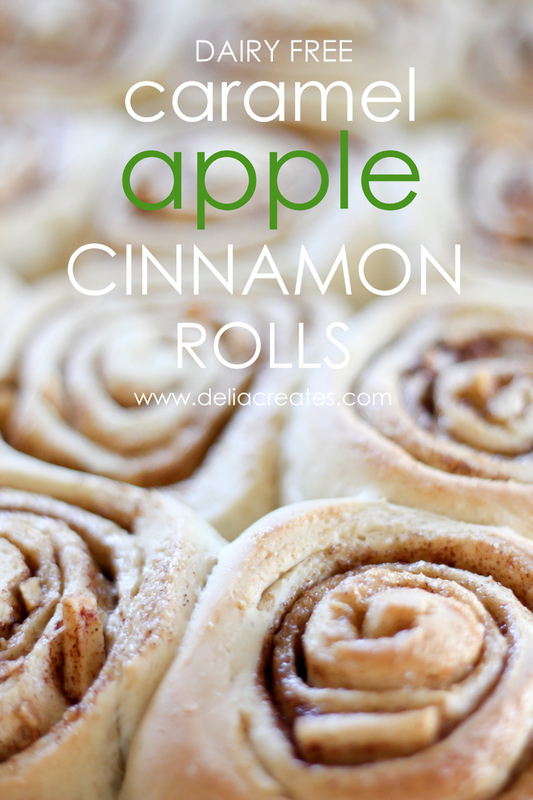 Apples also have water in them and if you have too many, you risk making your rolls soggy. 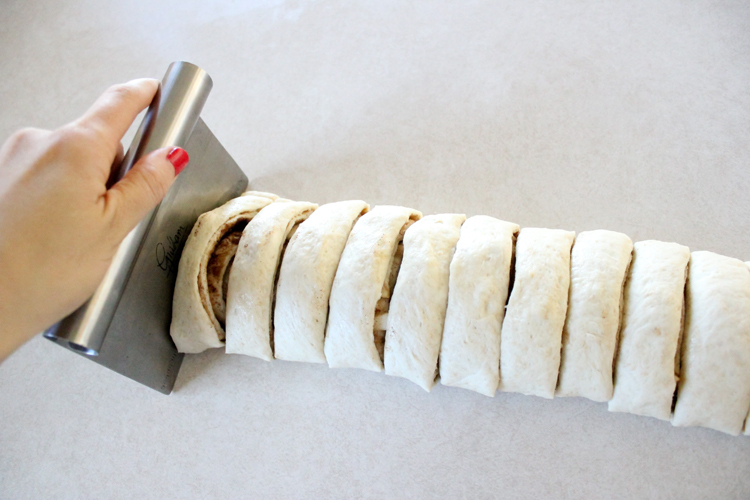 I prefer to use my bench scraper to cut the dough so I don’t have to put a cutting board underneath. It flattens them a bit, but with a quick pinch to the sides, the rolls easily spring back into shape. You should have enough to fill one large cookie sheet. Space them out just a little bit, so they have room to rise. I ended up with a few extras this time. I stuffed them into a ramekin and called it good. Turn your oven on to 175 degrees. Let the rolls rise in the oven for about a half an hour, or until the dough has doubled and all the rolls are touching each other. After they have risen the second time, turn the oven up to 325 degrees F and cook until just barely golden brown on top. While that’s baking, cook up some homemade caramel sauce. 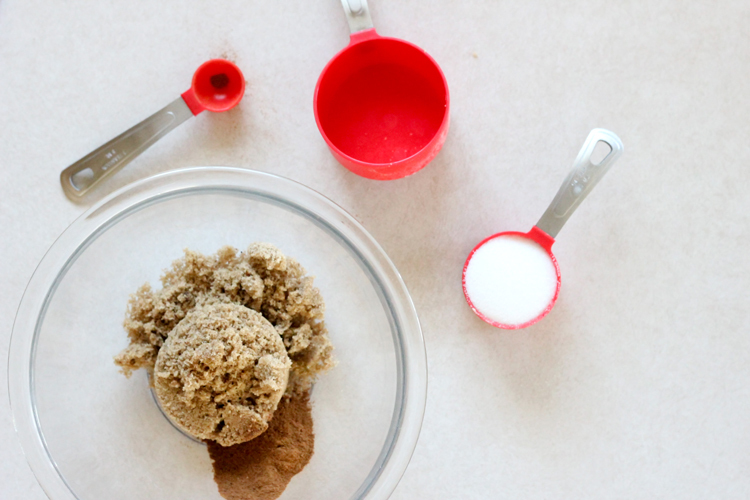 You can use your own recipe or use a jarred kind. 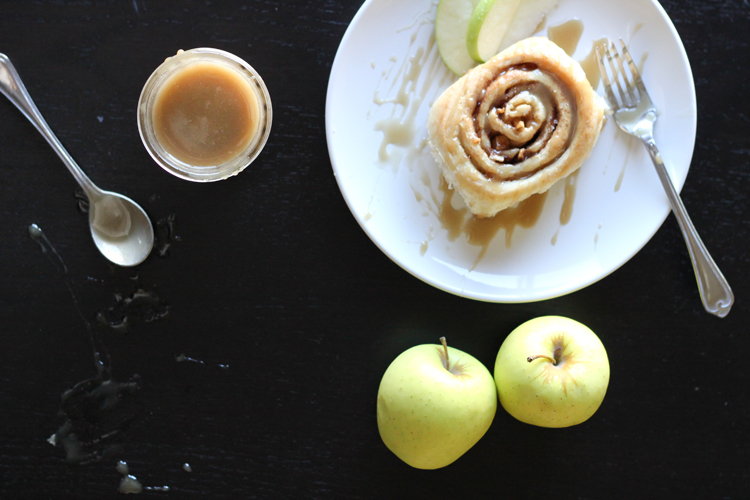 OR you make my vegan caramel sauce which I am sharing on my blog today. 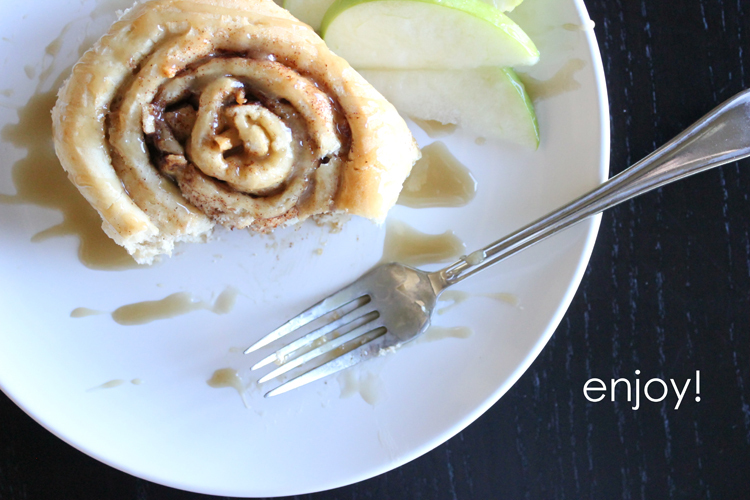 Go HERE for the sweet and simple recipe. 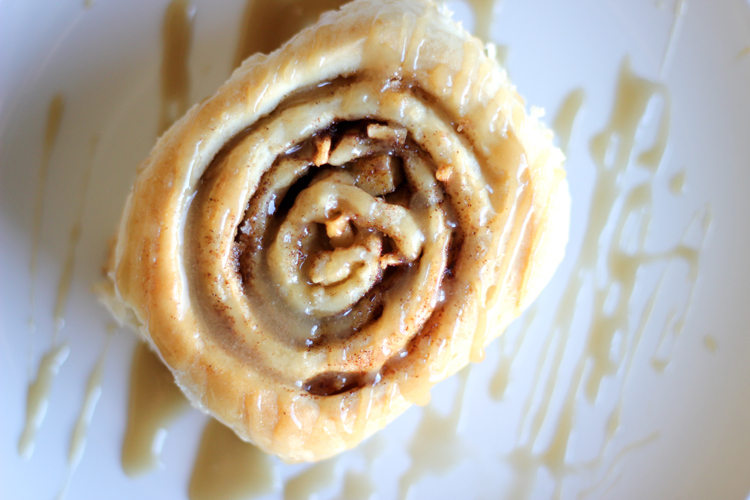 Dish up a cinnamon roll and smother it in caramel sauce. I have to warn you. This is SUPER good. 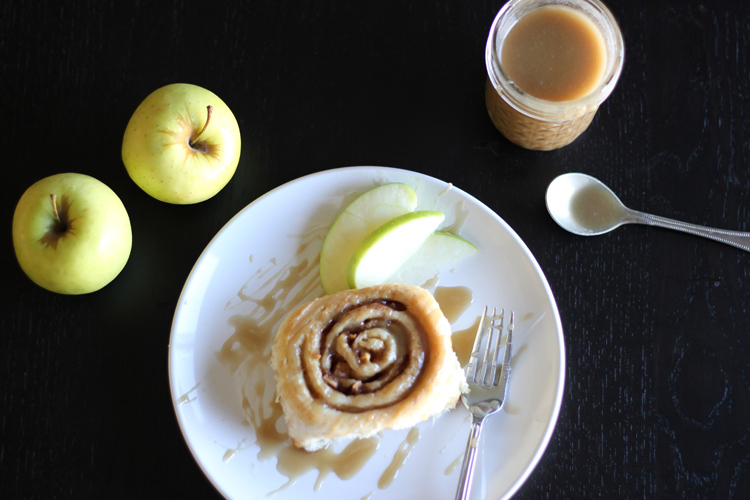 😉 The vegan caramel sauce is just sweet enough without being overpowering. And the apples with the cinnamon on a yummy, gooey bread. Here is a quick and dirty recipe for your convenience. Go HERE to print off the bread recipe. There is a link to print it at the end of the post. 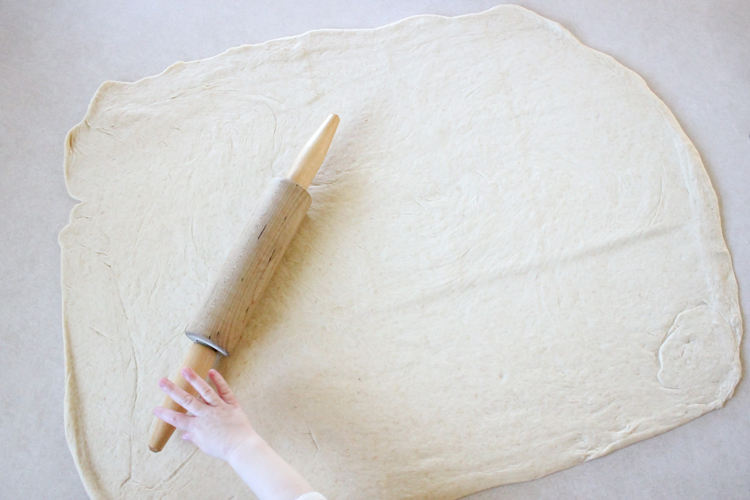 Just prepare the dough through the same way, until the first rise step. 1. Clean a large area of counter space. Spray with spray oil. 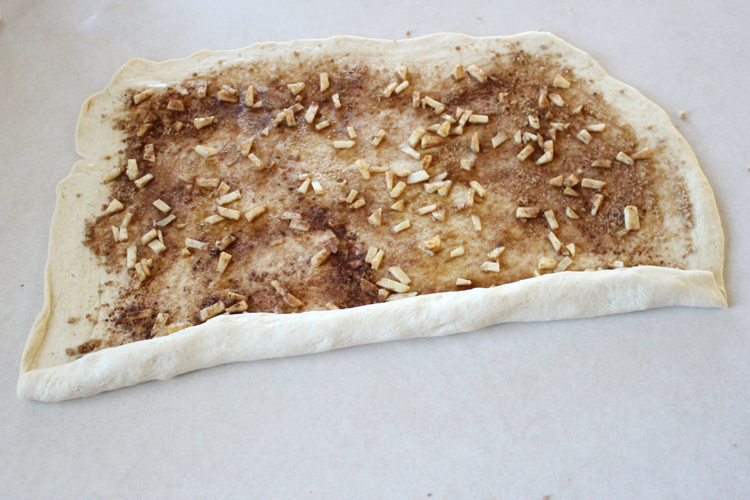 Punch down risen dough and roll out to a large rectangle with a rolling pin until it is 1/4 inch thick. 2. 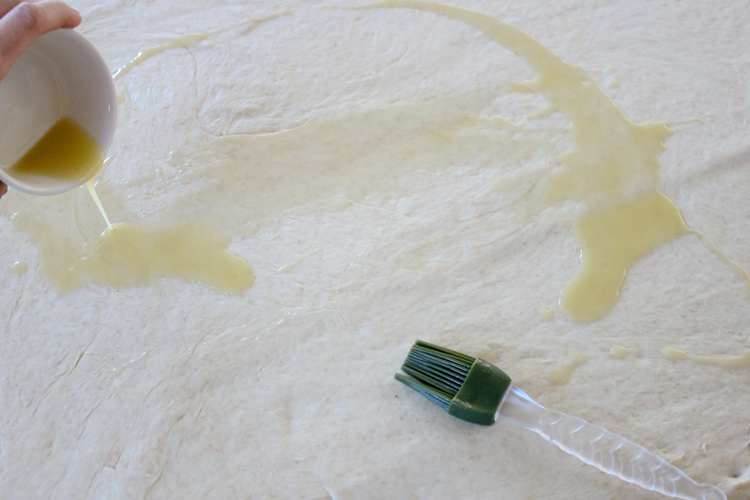 Brush melted butter or margarine all over the dough. 3. Mix sugars and spices together. 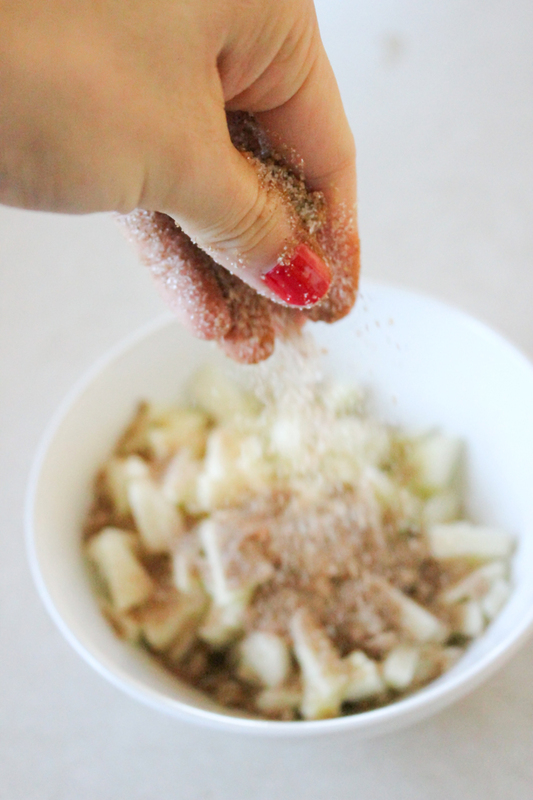 Sprinkle 1/3 of the the sugar mixture over the apples and mix well. 4. 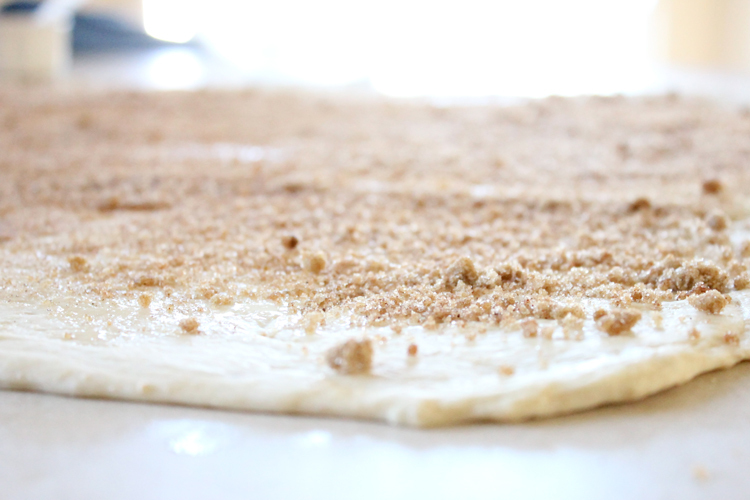 Sprinkle the rest of the sugar over the dough, in one nice even layer. Sprinkle the apples next, dispersing them as evenly as possible. 5. 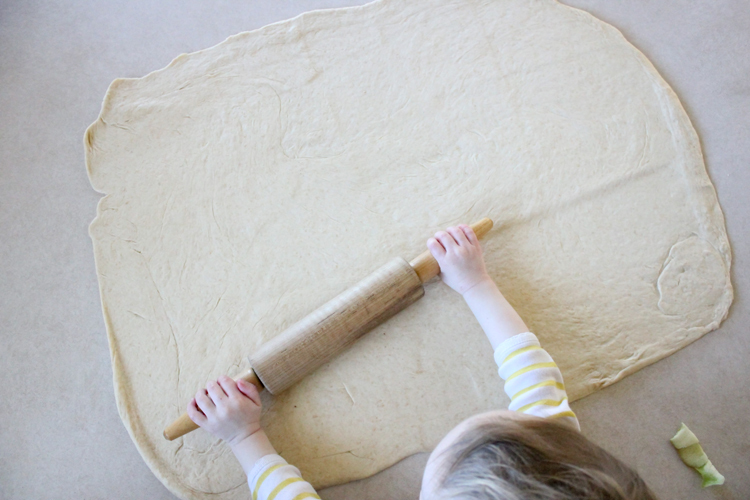 Starting at one of the longer sides, roll the dough up into a tight cylinder. Evenly cut the cylinder into disks. 6. 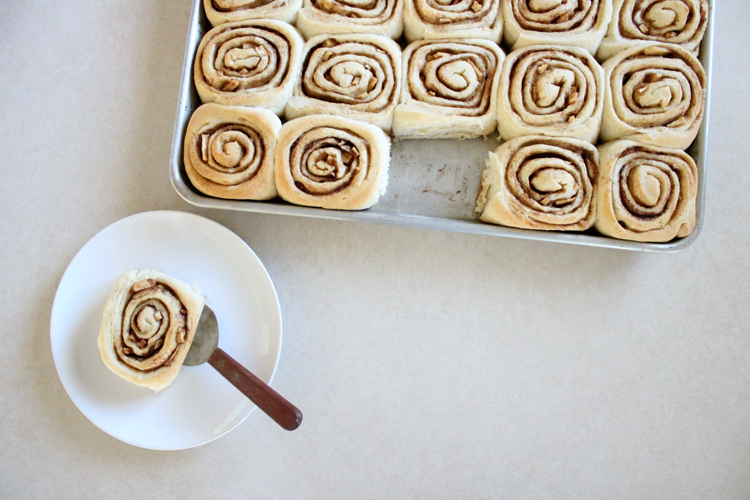 Place them on a large cookie sheet. About 20 rolls for one cookie sheet. You may have a couple extras which you can bake in a separate dish. 7. Turn the oven to 175 degrees F and put the rolls in. 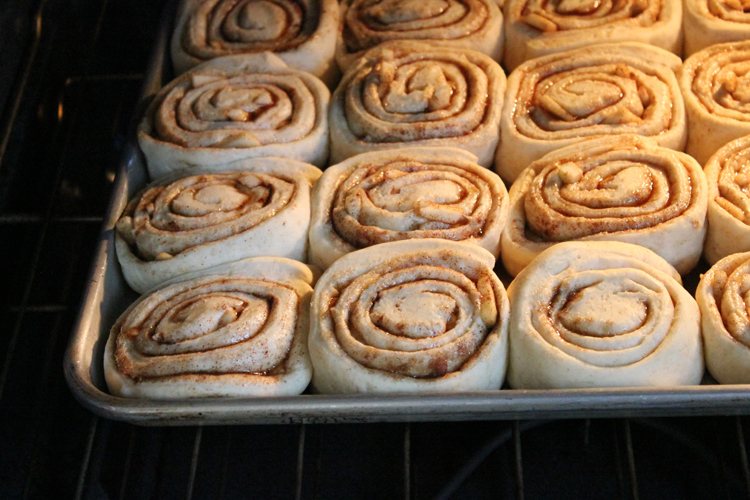 Let it rise for about 30 minutes or until the rolls are all touching each other and the sides of the pan. Then turn the oven up to 350 degrees F and bake for about 20-25 minutes, or until the tops of the rolls start to turn golden brown. 8. Remove them from the oven, drizzle with caramel sauce (my Vegan Caramel Sauce recipe is HERE), and enjoy! These look delicious!! And I absolutely LOVE the photos! !